China's frigate Huangshan is seen anchored in the waters off RSS Singapura Changi Naval Base, May 15, 2017, in Singapore. A surge in naval maneuvers in the South China Sea by Western allies this year is keeping China from any further expansion into the contested waters, analysts say. Vessels from Australia, France, Japan and the United States have sent ships to the 3.5 million-square-kilometer sea in 2018. They believe the sea rich in fisheries and fossil fuel reserves to be an international waterway, but China claims about 90 percent of it and has militarized several key islets. The foreign military exercises, naval ship passages and ports of call, along with one U.S. B-52 flyby have effectively stopped China from pushing ahead with expansion that’s also opposed by five other maritime claimants in Asia, experts believe. “You take a realist perspective of power, and it’s a way of ensuring the South China Sea is permanently contested,” said Alan Chong, associate professor at the S. Rajaratnam School of International Studies in Singapore. 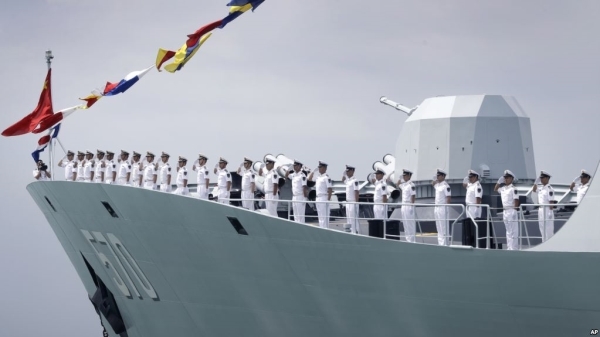 “So, the Chinese will issue angry statements and so on, warning of consequences, but the fact that all these multinational navies keep doing it in spite of Chinese warnings, it defies Beijing," he said. The number of hours of that navy ships have spent in the South China Sea has hit a high this year, said Carl Thayer, Asia-specialized emeritus professor at the University of New South Wales in Australia. The U.S. Navy has sailed naval vessels into the South China Sea eight times over the past 18 months and flew two B-52 bombers over it last month. This month the United States and the Philippines kicked off their own joint naval exercises to train Manila’s navy. Australia passed three ships though the sea in April en route to a goodwill visit to Vietnam, and Japan anticipates sending an Izumo-class helicopter carrier through the sea again this year as it did in 2017. Last year military officers from the 10-member Association of Southeast Asian Nations bloc boarded the Izumo. France passed a frigate and an assault ship through near Chinese-held islets in May.Reports in May of Chinese missiles deployed to the sea’s Spratly Islands galvanized much for the foreign naval attention this year, Thayer said. On Monday the U.S. Navy wrapped up its biennial RIMPAC exercises, which are based out of Honolulu. The series of live-fire drills and scenario-based exercises brought together 25,000 people from 25 countries including South China Sea claimant states such as Brunei, Malaysia, the Philippines and Vietnam. The Philippines gained from RIMPAC by “becoming comfortable” with allies and learning to “operate smoothly with them,” said Jay Batongbacal, a University of the Philippines international maritime affairs professor. All four Southeast Asian countries contest some of the waters that China calls its own. The United States dis-invited Beijing from RIMPAC this year. China criticizes these movements and often responds with its own. It cites historical records to back its claim to most of the sea.Chinese vessels followed their Australian and French counterparts. Its navy sent an auxiliary general intelligence ship this month to track the RIMPAC exercises near Honolulu, according to American media reports quoting a Pacific Fleet spokesman. In April, China held military drills for two days in the sea. They brought together about 10,000 personnel and 48 naval vessels.China wants to keep the others away, said Jonathan Spangler, director of the South China Sea Think Tank in Taipei. But use of the sea by Western navies effectively keeps China from building up more islets – many of which it has landfilled since 2010 – or testing the patience of the Southeast Asian maritime claimants, experts say. China “cannot assume on a roll and can take the South China Sea by stealth” as they build economic ties to get on the good side of other claimants, Chong said. Too much pushback against other navies would scuttle Chinese statements that it’s a good neighbor in Asia, he added. Western-allied ship movement now follows a Cold War pattern where American and Soviet ships tested each other's influence, Thayer said. U.S. and Soviet vessels had faced off, for example, in the Indian Ocean. China, Vietnam promise to keep peace in South China Sea.